The chairman of high-speed rail project HS2 is leaving his post after just four months. 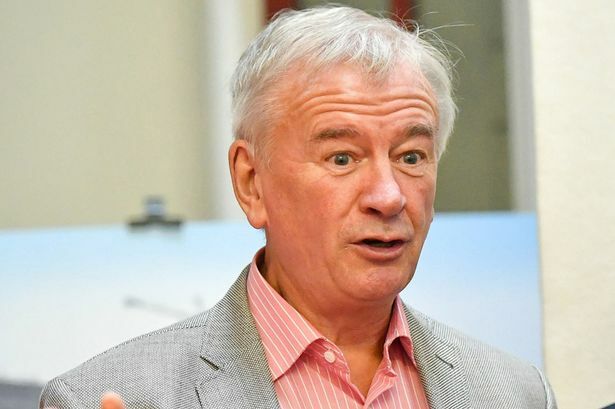 Sir Terry Morgan becomes the latest senior figure to jump ship from the £55 billion scheme to connect Birmingham and London. Sir Terry, who was previously chairman of the National College for High Speed Rail which opened in Birmingham last year, announced he was stepping down from both HS2 and also the chairmanship of Crossrail, in London. Recent reports suggested Sir Terry was predicting he would be sacked from both posts because of delays and over-running costs. He became chairman in 2009 of Crossrail, the new £15 billion rail line running from Reading and Heathrow to central and east London which was due to open this year but is now delayed until 2019. But he only took over at HS2 in August from Sir David Higgins who had served two terms as chairman. A statement from Transport Secretary Chris Grayling said: "Sir Terry has been an integral part of Crossrail for almost a decade and I would like to thank him for his dedication and the expertise he brought to the role. "I am also grateful to him for his work as chair of HS2." Allan Cook will succeed Sir Terry at HS2 while his replacement at Crossrail is yet to be confirmed. Mr Cook is a chartered engineer with more than 40 years of experience in the infrastructure, automotive, aerospace and defence industries. He said: "It is a privilege to be asked to take on this crucial role on UK&apos;s biggest infrastructure project. "HS2 will transform Britain through the creation of jobs and skills across UK industry. "It will improve connectivity and passenger experience as well as creating value for the UK economy." While plans to build new HS2 stations in Birmingham city centre and Solihull continue, the Government has been dogged by stories of unexpected departures. We reported in September the man spearheading the second phase of HS2, running from Birmingham to the North West, East Midlands and Yorkshire, had quit the role to take on a new job in Canada. Paul Griffiths is due to leave the post at the end of 2018 to become program director of the $40 billion Metrolinx project in Toronto. In 2016, HS2 chief executive Simon Kirby announced he was stepping down to take a newly created role with Rolls-Royce, eventually being replaced by Mark Thurston who previously worked on Crossrail. Last year, director general David Prout quit his post for a senior role at the University of Oxford, to be followed a few months later by chief financial officer Steve Allen. Mr Allen resigned after a damning report was published by the National Audit Office into staff redundancy payments related to the team&apos;s move to Two Snowhill in Birmingham.